Have you ever stopped to observe your kids? I don’t mean like a science experiment, but just sat back and watched them? How do they interact with others? Play by themselves? Talk with others their own age, older, an adult? Do they play gently or rough? Do they play the same with boys and with girls? What toy do they tend to play with the most? A doll, a block, a truck? What kinds of words do they use? 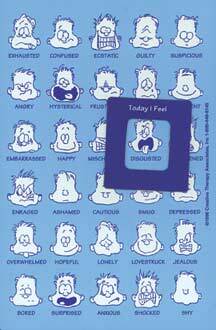 What kinds of emotions do they show? I remember one of my early childhood education classes very clearly. We were each assigned a specific child to watch in the school-run childcare center. It was details like these that we were to record, but in actuality we were to record every detail of the child’s behavior and interaction over the course of time we were in the facility. It started out seeming very boring, but as I learned in the class I realized it was actually quite interesting watching the child grow socially and emotionally as I read back over the observation notes. After writing the posts earlier this week (here and here) I found myself sitting back and watching my boys. I really took joy in that, and it dawned on me that even in just a week they’ve changed so much! I sat and totally listened to a story Cutie Pie told to Sweet Pea. It was amazing the new words he’s picked up in just a few days and the way he uses them appropriately! I was watching Sweet Pea play on the playground at church and the way he climbed the ladder to the slide so quickly without anyone’s assistance…I could see their little minds ticking away, processing, figuring things out, and it was exciting! I encourage you to take the time to sit back and just watch your kids sometime this week. Just take it all in…and in another couple of weeks do it again and see how they’re growing! Sometimes I get caught up in every day life and forget the little things. I don’t mean things like giving hugs or sharing kind words. I mean the simple things in relation to my interaction with my kiddos. I used to be very conscious of counting with them when I saw more than one item on a page or stopping to talk about something we saw when we were walking. I used to always be looking for opportnities to share with them. Lately, however, I’ve been tired. I see them playing well together, and instead of watching and/or joining in, I go and do the laundry or the dishes. Not that that in itself is bad, but I find at the end of the day that sometimes I’ve chosen to do other things rather than have fun with my boys. Writing that makes me feel like something other than a great mom. However, I know from talking with other moms that this is entirely normal. Having posted about it, though, I hope to be held mentally accountable and to be conscious about being present and seeking out opportunities and experiences to share with them. I want to be a part of their fun memories, not the mom who was always doing chores…These guys are worth not doing chores! How do you calm your kiddies down during a storm? Don’t you just love it when kids start to play with each other rather than just next to each other? It used to be that most of the time Cutie Pie was trying to direct the play, however, more and more lately Sweet Pea is trying to play with Cutie Pie, which sometimes still leads to altercations. I’m so glad my boys and I have such a wonderful man in our lives as their Daddy, my husband. Cutie Pie and Sweet Pea must know they are very much loved by the way Hubby plays, wrestles, dances and sings with them, reads to them, cuddles them, disciplines them, dresses them…the way he talks with them about things they are interested in and the way he always does simple things like waving and honking his horn when he leaves for work in the morning just for them. I’m so thankful they can feel this love every day. I’m also very aware some little people out there don’t have a Daddy like this in their lives, or don’t get to experience this every day and my heart breaks for them. Growing up I was blessed to have a wonderful father, an incredible next door neighbor, a step-father, and an awesome Uncle who all made me feel incredibly loved and protected, and who were wonderful examples in my life. Because of this I try to celebrate days like Mother’s and Father’s Days by including the very important people in my life, not just my parents. However, I don’t always manage to get it together enough to let them know and this year was one of those years, but my love and appreciation for these people are no less. I’m so very thankful I have these men in my life, and I’m so very thankful my boys are growing up knowing men like them. They pretended to be snakes, penguins, lions, elephants, kangaroos, monkeys and gorillas! Of course, this was a very hard thing to get a picture of, believe me, we tried! Their actions for some animals were so good that if we had been playing charades we could have guessed it correctly on the first try! I love spontaneous pretend play, especially when every bit of it stems from a child’s imagination with no prompting at all from an adult! Come along and play at Childhood 101 today! Caterpillar. Cat. Clouds. Colors. Count. Coins. Cookie. Cake. Carrot. Crayons. Construction. Circles. Clifford. Cutting. Clothespins. Cutie Pie seems to be slowing down in this learning the alphabet (again) area, so although we talked a lot about C words we did very little ‘hands-on’ with the letter C. He also seems to be petering out in the Bible Story area, not asking for one each morning and not listening the mornings he does want one. I’m not pushing the issue because he seems to be showing interest in other areas. 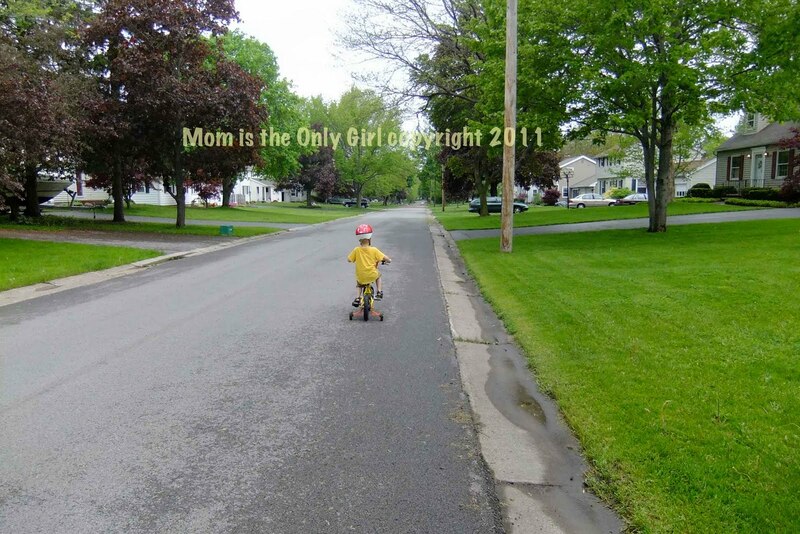 I thought, though, that I would share this one last Monday Mama’s week in review post about his letter learning. Also, I did take a bunch of pictures, but for some reason can’t work with them today. Bible Story – Abraham and Sarah and the birth of Isaac. In relation to this story we talked about feelings. We talked about how Abraham and Sarah experienced so many different emotions throughout the whole story and we used our “Feelings Mood Magnet” (from Creative Therapy Associates, Inc.) that we acquired for free somewhere along the way. This is a magnet that has simple line drawing faces on it reflecting a mood or feeling and comes with a red square magnet that you can move to frame a certain feeling. Cutie Pie really liked being able to associate feelings with pictures, although he always frames ‘hopeful’ when you ask him how he’s feeling! We also tied the letter C in to the story of Noah and the Ark a little further, talking about the different Creatures on the ark a little more. This was more for getting Sweet Pea into talking about Bible stories and worked like a charm! Science/Play – We had fun with fizzy sidewalk chalk this week and ended up mixing our colors! I saw similar recipes several places, like here and here, and I honestly don’t remember the recipe we ended up using, but it worked! 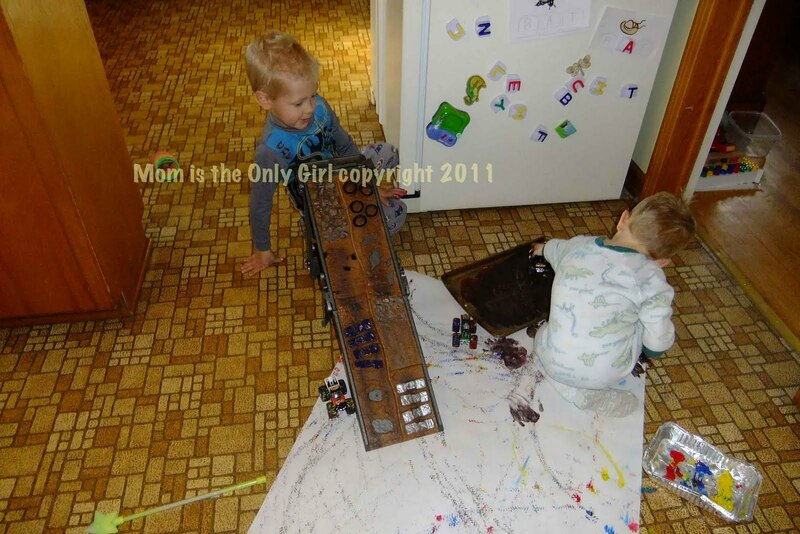 And the boys tried their hand at making colors by mixing the paint, of course, it never ended up the color they anticipated, but it was fun! We also spent some time talking about Construction equipment (are you surprised?) and watched a Couple episodes of Mighty Machines ! Cutie Pie expressed a strong desire to learn his numbers, which I am understanding as learning what they look like, so we will be working on that among other things this summer. Come fall I will have Sweet Pea in the mornings by himself, so Mama’s week in review may return then! I’ll keep blogging, though! Just a short story to hopefully bring a smile to your face this Friday morning! Monday morning I went in to get Sweet Pea out of bed and he’s sitting in his crib and says “I cleaned up my bed toys. I put them all over here. Now I’ll move them to the other side.” All his soft books were neatly piled up next to his Hippo and Carl dog who were sitting so nicely next to each other! Why can’t he do this at night during clean up time?! Now, on to the blog hops…. A couple of weeks ago we went, once again, to The Strong Museum of Play and discovered Zoobs ! I’m sure we’ve seen these before at Cousin’s house, but it was a while ago and neither Cutie Pie nor Sweet Pea were interested. This day I couldn’t pull them away from the huge bucketful the boys’ found! Now, this is a sensory box! How can I get this together for the wheels to connect? What coordination! Look at all that fine motor action and concentration going on there! They had so much fun with these that they are already on their wish list for Christmas, if we don’t get them before! Isn’t it awesome? Sweet Pea was thrilled! Animals, Lego Duplos and trains all on one table in a very organized manner – what more could a little guy ask for?! He loved the colors separated, that each group of animal was in it’s own little spot, and that his imaginary train people could see everything from the trains, even the construction equipment! Literally hours of fun for the boys! 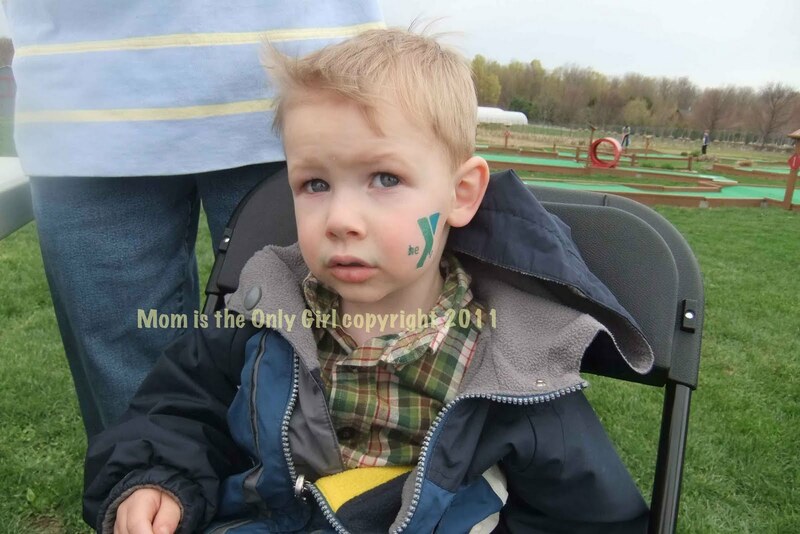 Linking up with We Play Tuesdays at Childhood 101 today! Boy. Bubbles. Berries. Bananas. Big Blue Boat. Bee. Balance Beam. Beads. Balloons. Bounce. Bunny. Bingo. Belly. Book. Bath. Brick. Building. Bang. Bark. Barn. Balls. Bike. Birds. Bat and Ball. Bugs. Birthday. Big Boy Bike. Blue Box Thomas. Can you tell we went over the letter B again? 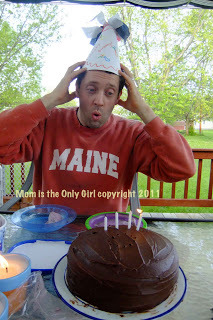 We actually had a Ball doing this the week before Memorial Day and it ended with a Big Birthday Bash for Hubby on Memorial Day. It was a fun, warm, outside kind of week, which led to a lack of photos – we were having so much fun! Bible Story – We found ourselves talking about Noah and the Ark a lot this week, a carry-over from letter A week! A was for Ark and Animals. B was for Build, Boat, Bears, Baboons, Birds. We talked about what it must have sounded like, smelled like, felt like on the ark as well as how the animals got along on the ark (predators, etc). Play – Since this is our second time going through the alphabet I’m trying to keep things at Cutie Pie’s pace and keep it light and fun, and since the weather was gorgeous this meant a lot of B outside fun was had! Balls, Bubbles, Bikes (Cutie Pie is loving riding around the block on his 2-wheeler with trainers still and this has actually encouraged Sweet Pea to start peddling his own bike, even though only his toes touch the peddles!) Bat and Ball. We heard Bees, Birds, Bugs and Bangs (from construction on a neighbor’s roof.) We also checked some bugs out up close and personal with our magnifying glasses! (science, math, coordination, gross motor, fine motor, letter/sound recognition) We did do a science experiment, which will be posted later this week. Snacks – chocolate covered Bananas, Banana cookies, Berry and Banana smoothies, and Birthday cake, too! B week was a lot of fun, and so was C week this past week…but that’s for next Monday’s post! Sweet Pea started playing this game in the boys’ little pool yesterday morning. He was jumping up and down splashing as much as he could, while counting each hop and giggling like crazy. He wasn’t exactly counting in sequence, but when I started counting with him hoping he’d catch on I heard “No, Momma, jump and count!” It wasn’t good enough that I jumped on the grass, I had to stand in the pool with both boys, all three of us jumping, while counting. But…he got it! He started counting in sequence and we all started laughing and giggling, and remarkably no one got hurt! 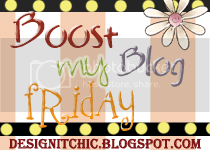 So, jump along to some blog hops with me! It’s really awesome to have a creative husband. 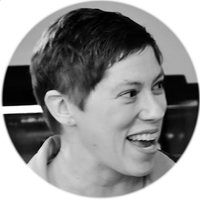 He writes music and comes up with some great ideas to get our kiddos doing things! Cutie Pie has been interested in writing rather than just coloring for a while, as I think I’ve posted about before. We have encouraged drawing and painting and other sorts of things to try to get Cutie Pie actually holding a writing instrument, but none of these things have made his socks roll up and down…until Hubby drew some mazes! Since Cutie Pie hasn’t done a lot of drawing and coloring, he needs help holding his crayons, markers, etc. (Horrible pic of me, but perfect of him holding his marker.) Cutie Pie loves following the mazes and often asks for them. 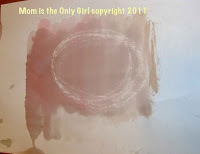 Hubby even got super creative and made one of Cutie Pie’s name, which he adores! Of course, Sweet Pea is always interested in what Cutie Pie is doing, so he had to give it a go, too. He’s our train guy, so naturally he drove his train along his mazes! …with a lot of concentration! Now, if you’ve been here before you know that I have been linking up here on Thursdays. Today I’m the Star Blog! Please go check it out! Put it in the oven for baby and me. I’ve told you before how coordinated Sweet Pea is always running, jumping, loving gymnastics. Well, a couple of weeks ago Hubby and Sweet Pea were playing and Hubby started saying this nursery rhyme and tried to introduce the movements to him, not expecting much. We were very surprised when Sweet Pea started getting the pattern of the claps and high five movements! (coordination, rhyming) I so wish pictures of this type of activity would come out clearly, even just to capture his smile! The boys and I like to go to The Strong National Museum of Play on days when it’s rainy and we haven’t been there in a while. A couple of weeks ago it was been rather gloomy, and since we felt a little caged in (it had been rather gloomy here for what seems like an eternity) we decided to take a field trip to The Strong and to treat ourselves a little bit, too, by going to Dancing Wings Butterfly Garden that’s housed there. Cutie Pie and I learned a bit about butterflies on the internet just a few days before this after he started asking questions about bugs, insects and butterflies! Also this particular morning he saw a bit about butterflies’ life cycles on a show he watched. It just seemed appropriate to go see real butterflies to continue the learning. They have a wonderfully informative short presentation before entering, which I loved. It helped prepare me to answer Cutie Pie’s questions while we were in observing. If you haven’t been before and have a butterfly garden in your area I strongly recommend going! Here are just a few of the pictures I took on our adventure. They are a little fuzzy due to the condensation – it’s much warmer in there than the rest of The Strong and it affected my camera, but I think they still turned out quite well! There are little plates of fruit here and there for the butterflies to eat from. Did you know butterflies taste with their feet? There are so many lush plants and trees in this large atrium. It’s gorgeous! There are also two little pools of water. This one is home to several turtles. This is Cutie Pie’s favorite thing to look at – a small pond with bright yellow fish! This was taken while we were peeking at the chrysalis holding area. including this one! Beautifully amazing! Cutie Pie and Sweet Pea seemed to have a difficult time when we were in there. Sweet Pea would only whisper and Cutie Pie seemed almost scared to walk. They stuck right next to me, making it a little difficult to take pictures at times, and continually reminded me that we were instructed to talk quietly and move slowly. After we returned into The Strong, I asked the boys what they thought about the butterflies and found out they were so afraid of stepping on a butterfly or one of the many birds that can be found pecking around on the paths. They did both say they want to go again to see the butterflies, though! I guess they did enjoy it! With the warm and sunny weather the past few days we were able to get outside for some more chalk play, much to my boys’ delight! We stuck with more simple things, though, as they both have colds (yet) again and I’m still recovering from mine, so learning something new or being super creative was not on the agenda. Simple chalk play is always fun, though, even for adults, don’t you think? 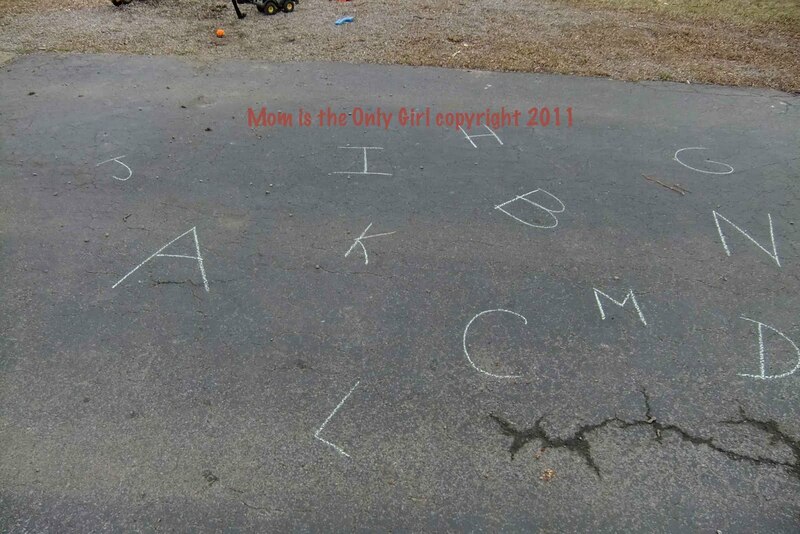 We played hopscotch and painted with chalk paint. 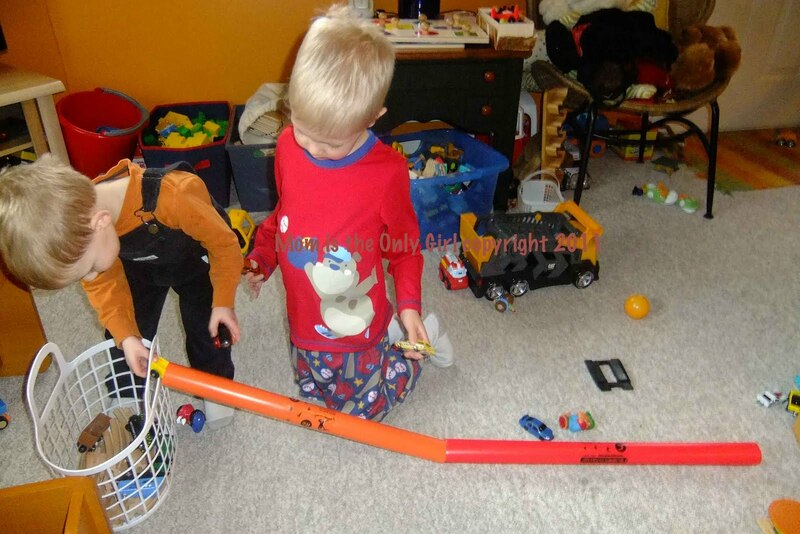 The boys also directed me in creating a road for them to ‘drive’ their trikes on and use as a running path (including trees, houses and driveways) and helped me in drawing a train track to follow as they pretended to be steam engines (pic from the first time they requested a track a few weeks ago). Head on over to Childhood 101 if you need more play inspiration! Zebra. Zig Zag. Zip. Zero. Zoo. Zoom. We didn’t talk a lot about words starting with Z this week, the boys were preoccupied with other things, but that’s OK. However, we did do a lot of playing with Z things! Bible Story – We followed Hubbard’s Cupboard’s suggestion and talked about Psalm 51 this week. Since it wasn’t really a story I thought the kiddos wouldn’t like it. I was partly right, as Sweet Pea always got down to play after the first few verses each day. Cutie Pie, however, listened intently. I tried my best to explain to him what some of the words meant and tried to break it down into sections and explained the meaning as best I could. The last day we read it all the way through and talked about how we can become white as snow by believing Jesus died for us and asking forgiveness for our sins. I explained that this involved talking to God, and that’s what we are doing when we pray and that we can talk to God whenever we’d like. He started talking to God right then and asked him to forgive him for something that he did. Then he kept very still with his head cocked to one side. I asked what he was doing and he said he couldn’t hear God talking to him! He was so sincere in the asking and in his response to me, it was hard not to giggle! Language Arts – Cutie Pie again started coming up with words beginning with Z all on his own at random times throughout the week. He always caught me off guard, too! Usually when we come up with a letter of the week word we write it on the white board side of our easel and we did this with our Z words, too. Mostly the boys liked the words Zoo and Zoom this week, so we did a lot of Zooming of cars and we took a field trip to the Zoo. I was also impressed one day when I was just doodling, making Zig Zags on black paper with colored chalk at the table while the boys were finishing breakfast (hoping they would be into creating something for Nana for Mother’s Day) and Cutie Pie started drawing Zig Zags with me! I love it when he takes the initiative to try to write and draw! He’s getting really good at the letter P! This week we took a field trip to the Zoo. First, it was letter Z week. Second, it was finally sunny and relatively warm! We were all very excited to go see the animals, be outside, and have some fun! Unfortunately, we must have gone at an off time because most of the animals were in their dens while their cages were being cleaned or were sleeping. The boys had fun, though. As we walked through the Zoo we talked about the different animals we saw – how big they were compared to the previous animal we saw, their colors, what they eat, how many feet they walk on if they walk, etc. Even though Seneca Park Zoo is a fairly small Zoo, it almost always takes us a good 2 1/2 hours to go through it because my boys love to stop and watch the animals! Then there’s the Zot Zone where they can pretend to be a veterinarian taking care of animals, where they learn by doing. They love this place! And of course we did a lot of zipper practicing! Now that we’re done with learning the letters of the alphabet Cutie Pie wants to learn to count higher, so we’re moving on to numbers while we keep reviewing our letters. I think I will concentrate more on lower case letters and the letters in the boys’ names this time around! I’ll continue posting on those to complete our alphabet pages. Any and all ideas are welcome! Hubby is a string music teacher at two of the local grade schools, and every morning when he leaves for work he takes along his violin and viola, sometimes his string bass and amplifier, too, to teach the students with. Most mornings the boys don’t get to see him leave for school as he leaves early to work out first, but once or twice a week they wave goodbye to him. wanting to get their Daddy’s hat and coat on (it’s been very rainy here and he wears a funky almost-cowboy hat because he can’t carry an umbrella and his instruments and briefcase (and bass and amplifier) at the same time). I was fascinated as I watched the boys for almost 20 minutes pretend they were their Daddy on his way to work. Several times they went through all the actions, setting the instruments down by the door, pretending to put on their jackets and hat, pouring coffee, hugging me goodbye and saying “go to the window, I’ll wave!” It made me realize just how much they watch their Daddy’s every move and understand the meaning behind them and how much little things like the routine of watching from the front window to see him waving from the car mean to them! Every day Cutie Pie says “When I’m Daddy….” and this day he really was! Sweet Pea has really been growing by leaps and bounds lately, and not just in size! This week he was playing with his trains, like normal, but then started counting! He had grabbed a bowl with one hand, and trains with the other and took them from the tub to the bowl one by one while counting! Love it! We’ve always counted out loud as we go throughout our day, pointing out the number of birds on a page of a book or how many socks I had in my hand to put on him, but now he’s counting to 4 or 5 accurately! He must indeed be learning from his older brother, who has been counting things almost constantly as we go throughout our day! It’s so satisfying to see the learning being understood! Cutie Pie made up this outdoor chalk game, so I cannot take credit for it at all! First, make sure you have several different colors of chalk. 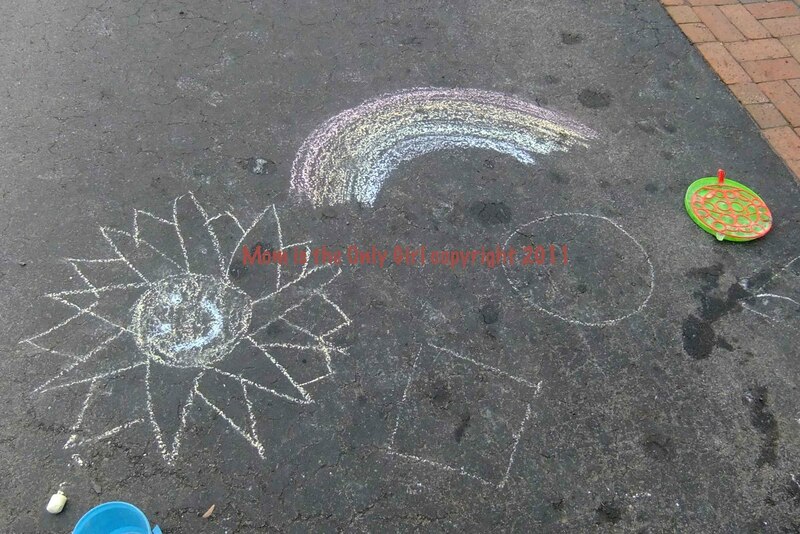 Next, draw a few shapes with each color of chalk. Finally, call out a color and shape and watch the kiddos run to find the correct place to stand! 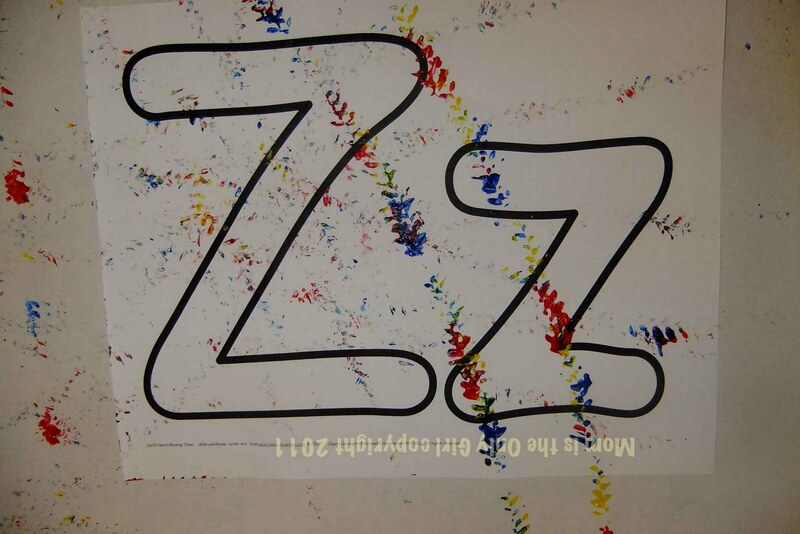 We made this a little more difficult once or twice by adding a letter or number inside the shape! 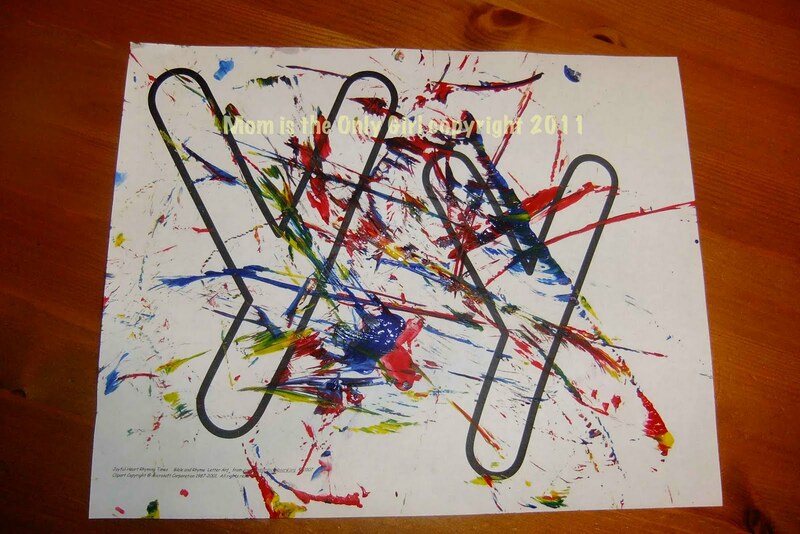 We made this more simple by drawing one shape in different colors, calling out the color to run to and by drawing different shapes in the same color, calling out the shape to run to. These were perfect revisions to this game to get Sweet Pea interested. But we also made all one shape and put in different numbers (like in the pic above) or different letters! Simple, but so fun, and especially neat because Cutie Pie came up with it on his own! I’m planning on sharing more chalk fun we’ve been up to on Tuesdays for a few more weeks, so come back! For other fun play ideas check out We Play at Childhood 101! Yo Yo. Yogurt. Yawn. Yelp. Yellow. Yip. Yell. You. Yarn. Yikes! Bible Story – This week’s story, as per Hubbard’s Cupboard, was the story of Jesus’ resurrection. We didn’t read the story all in one shot, but over several days. Cutie Pie was anxious to hear more of the story each time. The last day he was very excited, “because Jesus is alive!” How cool is that?! We tied this story in to the letter Y, because Jesus died for You! 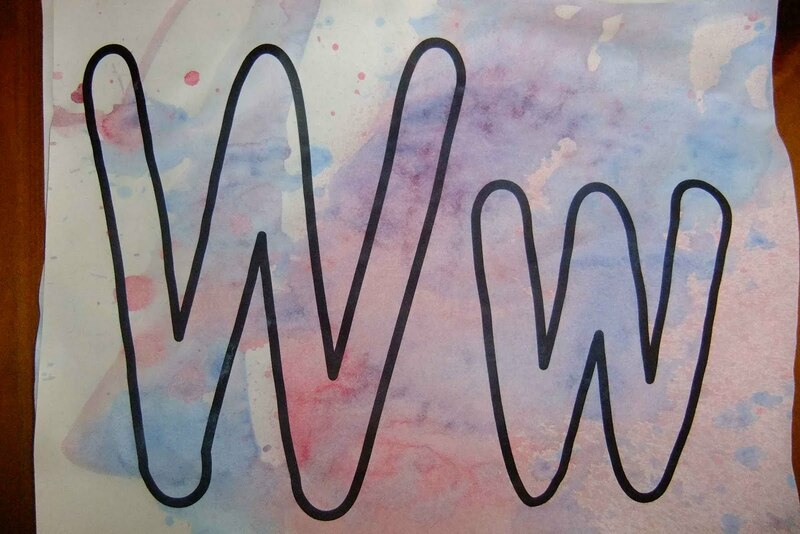 Language Arts – We listed every word starting with Y that we could think of this week and it seemed more kept creeping up as we talked about everyday things. I love that when they sneak up on You and especially when it’s the kiddos that realize they thought of one! Also, Cutie Pie can now almost sing The Yellow Submarine song! Art – Cutie Pie wanted to paint his letter Y yellow. Simply put. However, he never actually sat down to paint or color it even though I gave him several opportunities. Sweet Pea, however, wanted to do Yarn art when I suggested it, so he was very excited and really got in to it, although Cutie Pie could have cared less! I got this idea from The Toddler’s Busy Book by Kuffner , although I didn’t tie the yarn to popsicle sticks as suggested. Instead we just used our fingers to poke 6-inches of Yellow Yarn around in tempura paint, then plop it onto our paper and pull it along to make designs. We also tried laying it on the paper, folding the paper however we wanted and then opening it to see the pretty result. 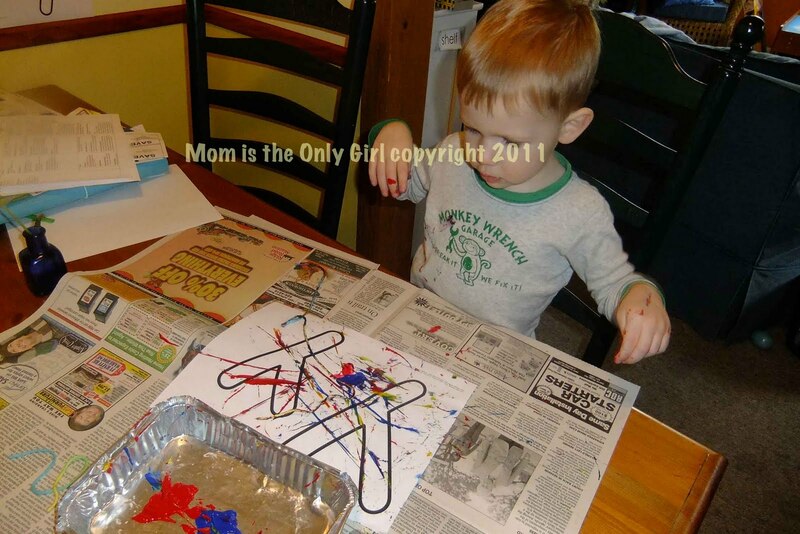 (fine motor, coordination) Sweet Pea loved this – mixing the colors of paint in the pan and seeing the result on his paper! (science) This sort of doubled as our science experiment this week. I was down with a cold and Cutie Pie seemed to want to be on his own for a lot of time, so Sweet Pea and I talked a lot about how the paint colors changed when mixed together during this Yarn art project. Play – The kiddos played a lot this week, mostly on their own, which was good for me to rest a little to get over this cold. 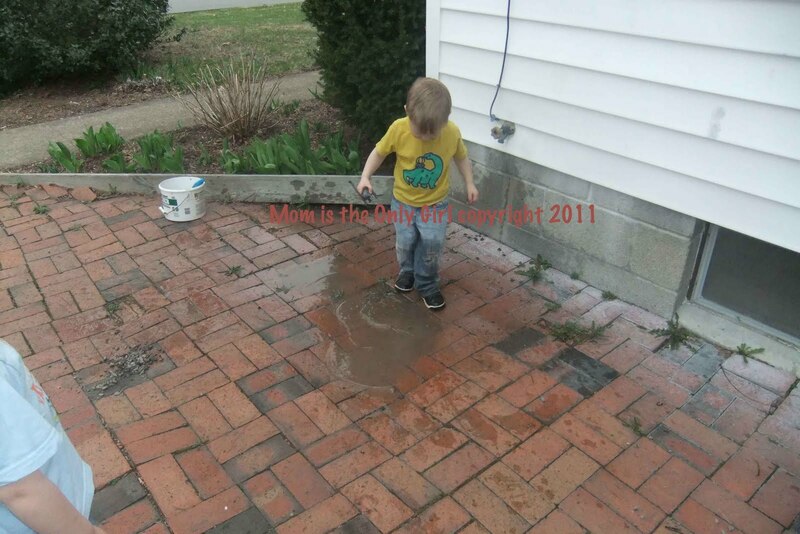 Outside we did more chalk play on the driveway (fine motor, gross motor) as our backyard is still a swamp, however the boys did get a good soaking back there playing in the “sandbox pond” while I hung up laundry (with my rain boots on and the water sopping up over the top of my feet!) 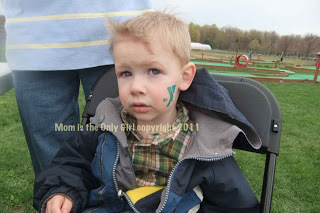 We also visited a local park and had fun at the opening of Wickham Farms (in conjunction with the YMCA, hence the above pic of Sweet Pea with a Y on his cheek!) where Cutie Pie did a whole lot of physical play, which isn’t his style! I’ll have a separate post about that because it was a lot of fun for both adults and kiddos! (gross motor, coordination) And we paid another visit to The Strong Museum of Play where we noticed plenty of new things, and which is also worthy of it’s own post! Sweet Pea and Cutie Pie have been playing with play dough quite a lot lately. It seems Sweet Pea has also been watching Cutie Pie when he uses the scissors during these times, too! These pictures are of what I observed Monday night when we pulled the play dough out. Just look at that concentration! He’s also been asking for help cutting his food with his fork, or asking for a knife to try to cut food on his own. So far we’ve let him try cutting his own pancakes, but he’s not that good at it yet! I guess it’s great he’s getting so much practice on play dough with plastic knives and scissors! We spent quite a bit of time outside last week and a lot of that time was spent with chalk dust on our hands! We did your typical sidewalk chalk drawing and coloring, but also made up a few games of our own. Next Tuesday I’ll share some more chalk games we did! Check out Childhood 101 We Play Tuesday for more ideas! I had high hopes this would be a good week since Hubby was home to help with letter X. 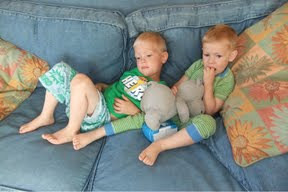 However, the letter X is challenging plus both boys had colds (yet again) so it didn’t go as smoothly as I’d have liked. X-ray. Xylophone. eXtinct. eXit. Excavation. Experiment. We didn’t cover a whole lot of words, and actually only really spent time on eXperiment, eXtinct and excavation. Mix dry ingredients and add water until you can form an egg without it falling apart. Form an egg shape around a plastic dinosaur and let dry for several days. Excavate carefully! Another science activity we did was about one way dinosaurs became eXtinct and was spurred on by a different friend’s e-mail about a science kit she bought at the grocery. 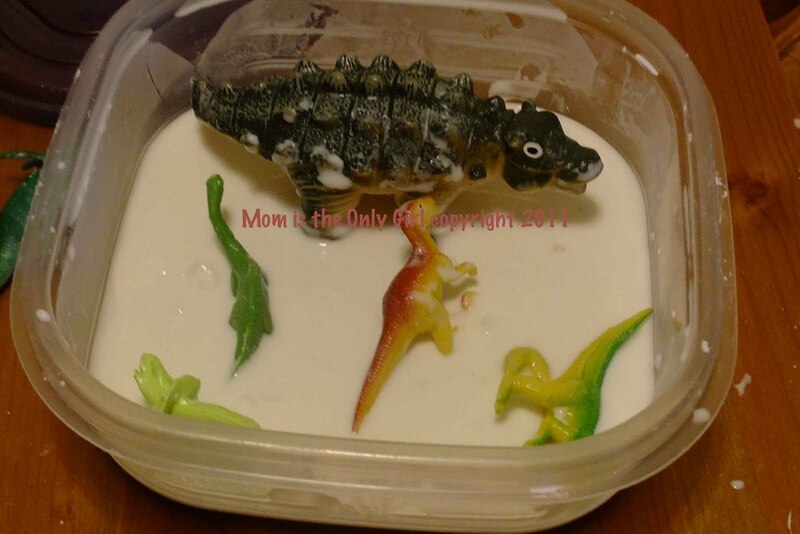 We combined cornstarch and water in a bowl and played with our dinosaurs in it. It was something we played with before, but not in this way. As the dinosaurs were left sitting on the mixture, as dinosaurs might have sat on mud by a pond while having a drink, their feet sank and formed a suction when we tried to pick them up! Cutie Pie loved doing this experiment getting very excited that it was a little hard to pull the dinosaurs out and related it quickly to when he was out in the mud and his boot was pulled off his foot as he tried to take a step. Then he realized it would have been hard for dinosaurs to walk in this sort of gook and that they would have been stuck! He labeled this an eXperiment all by himself! We were also very busy this week running errands, fiXing things with both real and toy tools, visiting family, and celebrating Good Friday and Easter! The letter X might be a letter we review again down the road. Wanted to try: Scavenger hunt using X marks the spot. Pirate hats with the traditional X symbol on them. 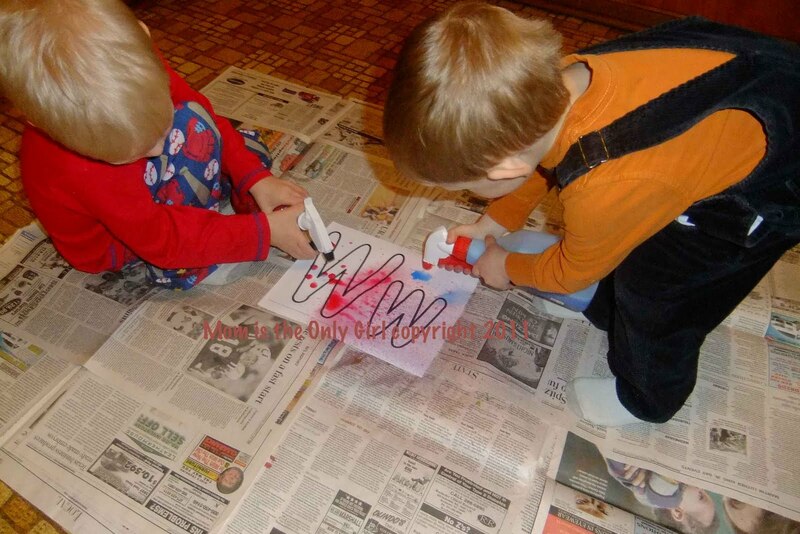 Make bones out of crumpled up paper and white glue/water mixture and play with them – look like X-rays. It’s finally getting nice outside, at least on some days it is! Earlier this week is was almost 70 out, although windy, and it felt great to be outside with the kids having fun. Sweet Pea asked for some bubbles. I found the different size bubble-makers, poured the ‘juice’ and stuck out my arm. The bubbles flew and the boys got running after them! There were so many giggles coming from our driveway and front lawn that I’m sure some of our neighbors were peering out their windows or at least smiling! My kiddos sure slept well that night after so much running, falling and giggling! I wish I could have gotten pics…. 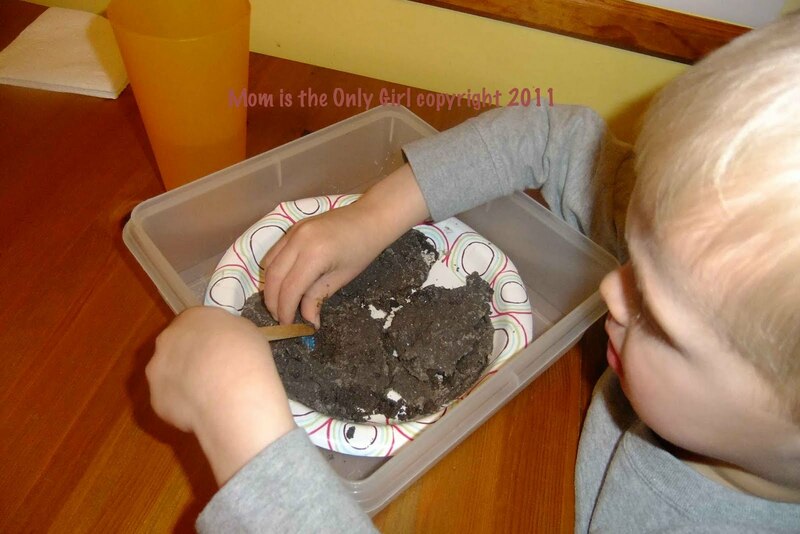 Check out Childhood 101 for ways other kiddos are playing and for some great ideas! We. Wet (lots of rain this week). Well. Water. Wash. Wish. Want. Wail. Wonder. Wipe. Wild. Wind (very windy, lost some siding on our house). Wiggle. Wagon. Went. Walk (some beautiful warm days). Words. Weather. Window (opened!). Workout. Bible Story – Jesus heals the paralytic. Cutie Pie was intrigued by this Bible story and thought it was so neat that the paralytic’s friends would carry him and drop him through a roof to meet Jesus. I don’t think he understood the whole healing part, but it gave me the opportunity to talk to him about wheelchair-bound people as We’ve seen several people lately who are bound to Wheelchairs. We did talk about the faith the friends had and what it must have been like for the man to get up and Walk after not having Walked before. 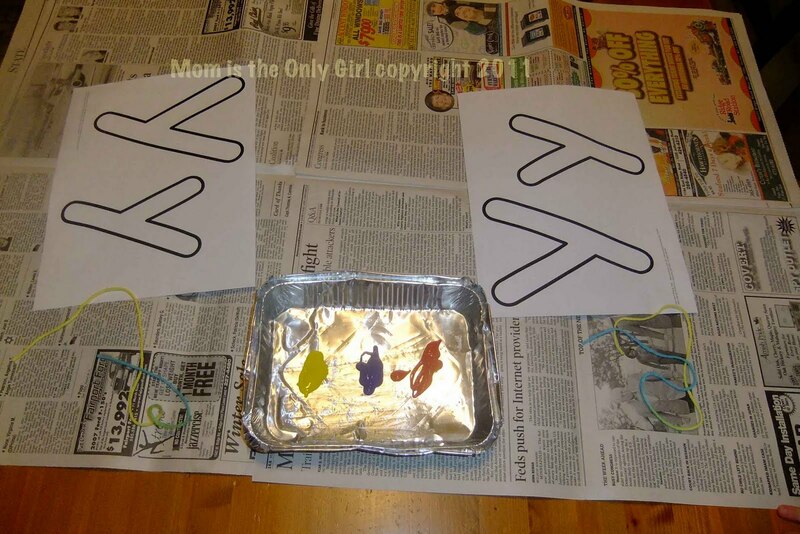 Science Experiment – We actually did three Wet experiments, two involving balloons. 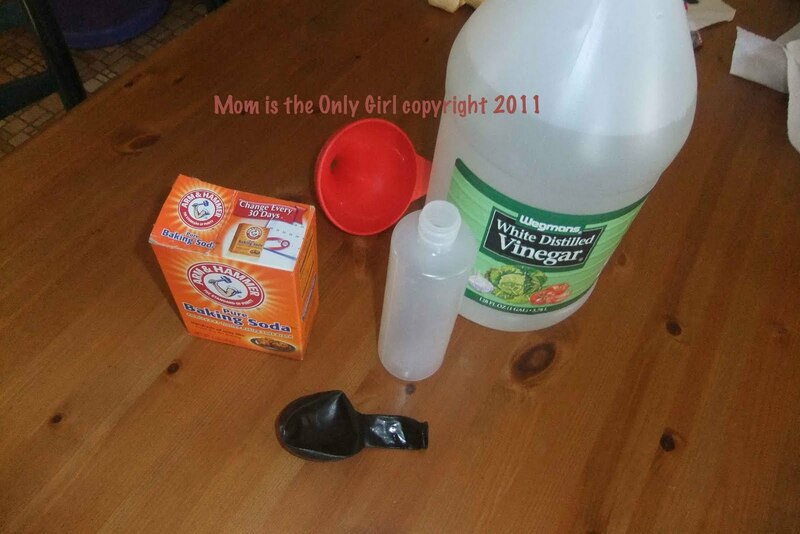 Experiment #1 – We did a Wet experiment with a balloon, vinegar and baking soda. We took a dry 20-oz plastic bottle and placed about 1/2 cup of vinegar into it. In the balloon we placed about 1 tablespoon of baking soda. We then placed the balloon carefully onto the bottle, so as not to spill the baking soda into it yet. With Cutie Pie holding the bottle, Sweet Pea then raised the balloon and gently shook it to make the baking soda fall into the bottle and We Watched the balloon inflate. The kiddos loved this so We did it several times! What happens? The vinegar and baking soda combine and give off carbon dioxide, which takes up more space than air and fills up the balloon! 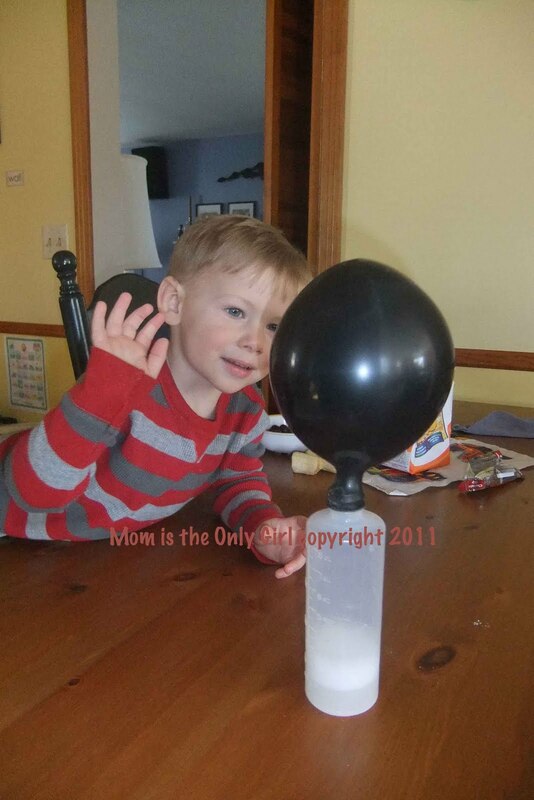 Please be careful if you do this experiment as the balloon could pop! (observe, contrast, compare) I found this experiment on Amazing Preschool Activities although we didn’t let the rocket fly like in the experiment. Experiment #2 – We cleaned the bottle and placed another balloon on it. We then placed the balloon into a bowl of hot Water and the balloon inflated (although slightly). 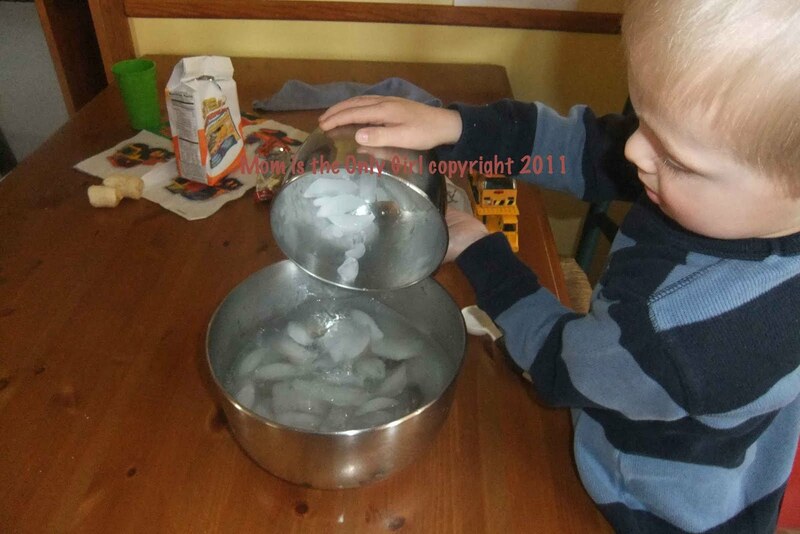 Then We placed the bottle into a bowl full of ice cubes and the balloon deflated. We talked about hot air taking up more space than cold air. Of course, my kiddos love playing with ice cubes and Water, so this led immediately to our next experiment…(observe, contrast, compare) I’ve seen this and experiment #3 on several blogs and science websites lately, although I neglected to write any of them down. When I find them I will update this with links. Experiment #3 – Which is heavier? Water or Ice? Simply dump the ice into the water from the above experiment. Does the ice float? We expanded on this simple experiment and talked about what happened to both the ice and the water. Did the water get colder? Did the ice get warmer? Did the hot water make the ice hot? Of course, we had to do this experiment several times, too! The beginning of the week was beautiful so we opened our Windows and played outside with bubbles and after it rained We splashed in Water puddles. We Went swimming in the Warm Water at the Y. At the end of the Week we had a lot of Wet rain and lots of Wind. A good week for W! …playing his guitar like a violin! Boy, this guy is in love with stringed instruments! The other day Cutie Pie and Hubby went to the store and I found myself alone with Sweet Pea…at home…and he was awake! This never happens! When I have him by himself we are usually going somewhere, so this was a special day! 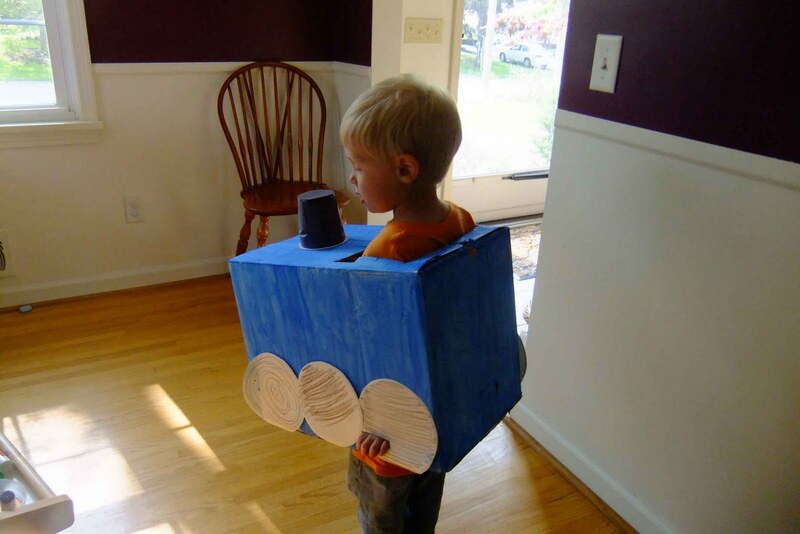 After the guys left I asked Sweet Pea what he wanted to do, expecting him to say “play trains”. We ended up outside at his request, again something that never happens with him. It was so fun playing in the muddy yard with him. He swung for a really long time – both on the baby swing, and on the ‘big boy’ swing! What a change from last year! He was even trying to pump to get going on his own! Now when I ask what he’d like to do (when Cutie Pie is busy trying to get his coat on) he either says “swing” or “play trains” in that order! What a nice change…..most of my jeans have holes in the knees! How have you been playing outdoors? Check out We Play at Childhood 101 for new ideas! Vine. Vehicles. Violin. Vase. Vegetables. Velcro. Vent. Violet. Vanilla. Veterinarian. Vacuum. Voice. Vibration. Vulture. Vertical. Volleyball. Vision. First, I poured flour into a tin, until it was about 2 inches deep. Next, one by one we took the chosen objects (several balls of similar size but different weight, a square magnet, a larger heavier ball) and dropped them twice into the flour, first from the kiddos shoulder height while kneeling, then from shoulder height standing up. After each object was dropped we examined what the crater looked like – how deep it was, how wide it was – and talked about how much flour was moved when it dropped. We followed that by dropping two different objects from the same height, trying to get them to land in different spots and we compared the craters to each other. The boys also noticed the textures from our objects left imprinted in the craters, which was something I hadn’t thought of! We ended our week taking a trip to the zoo to see the Vultures! We didn’t end up decorating our letter Vs, however, we did talk about pasting dump truck cut-outs onto them, because, as Cutie Pie puts it, “they’re Vehicles!” We also didn’t get to the vibrations experiment or the volume experiment, but that’s OK, it will give us something to do on one of these rainy days! It seems like almost every child has the opportunity to learn to play the recorder through school. Did you know there are actually several different ‘sizes’ of recorder? Soprano – the recorder you usually see and can buy in stores, alto, tenor and bass. This was another day the boys wanted to play one of Hubby’s instruments. Since they already have a recorder (which is bright green, but is still a real recorder! ), Hubby thought he’d bring down the different size recorders he has and see what they thought! As you can see they loved playing them! I am tickled that the boys have an interest in music at such a young age, and, even though Hubby is a music teacher (strings, in particular) we aren’t going to push lessons just yet – just exploring! If you’re interested in letting your child check out some instruments up close, check with your local music store or school, or local person giving music lessons to see if your kiddo can come ‘play’ with the instruments! Sometimes even community centers offer a ‘program’ where kids can get up close and personal with instruments. If yours doesn’t maybe you can suggest it! Also, check out any professional groups that offer child-friendly concerts. Quite often these organizations will have a ‘petting zoo’ before hand or during intermission. It’s a great way to get kids interested in music! 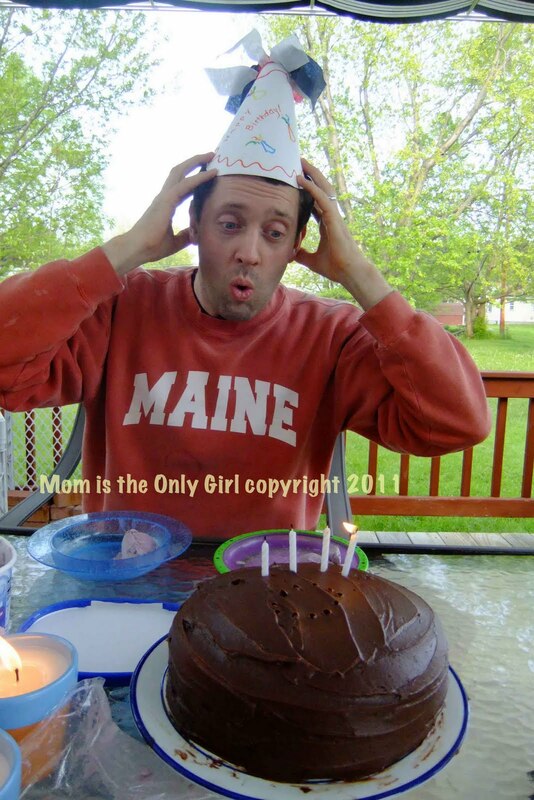 I’m hopping along with a few blog hops again today, and today is the last day for the Ultimate Blog Party at 5 Minutes for Mom! Check them out with me! First Bike Ride of Spring! Yes, that’s right, they BOTH got off their bikes and pushed them up the hill! I could see the little cogwheels turning in his head and have to admit I was a little nervous about what his solution would be, but was so relieved and proud when this is what he came up with! Great problem-solving! I’m joining Bassgiraffe’s Blog Hop Thursday this week, and if you haven’t already headed over to The Ultimate Blog Party, you’d better check that out too! Sweet Pea on his way up past me – the faster he runs, the higher the instructor makes him go! I wish I could have gotten the huge smile he had on his face! Sweet Pea on his way back down – sorry it’s blurry…but it captures the moment! Sweet Pea has always been our little lovey, and you can usually find his lovey, Hippo, with him wherever he goes. Even though Hippo is Sweet Pea’s lovey, he isn’t always that loving towards him…until lately! This is a new kind of play for him!